October, 17th to 20th, 2019. First three days: 9am to 12m, 2pm to 5pm. Fourth day: 9am to 12m. English; Translation to Spanish available. Universidad San Ignacio de Loyola (USIL), La Molina, Lima, Peru. Adrian V. Hernandez ; John P.A. Ioannidis ; Jos Kleijnen ; Eric Boersma ; Maciej Banach ; William L. Baker ; Roop Kaw ; Vinay Pasupuleti . Vicerrectorado de Investigación, Universidad San Ignacio de Loyola (USIL), Lima, Peru. University of Connecticut (UConn), Storrs, CT, USA. Adrian V. Hernandez, MD, PhD, FACC, FESC. Researcher, Vicerrectorado de Investigación, USIL, Lima, Peru. 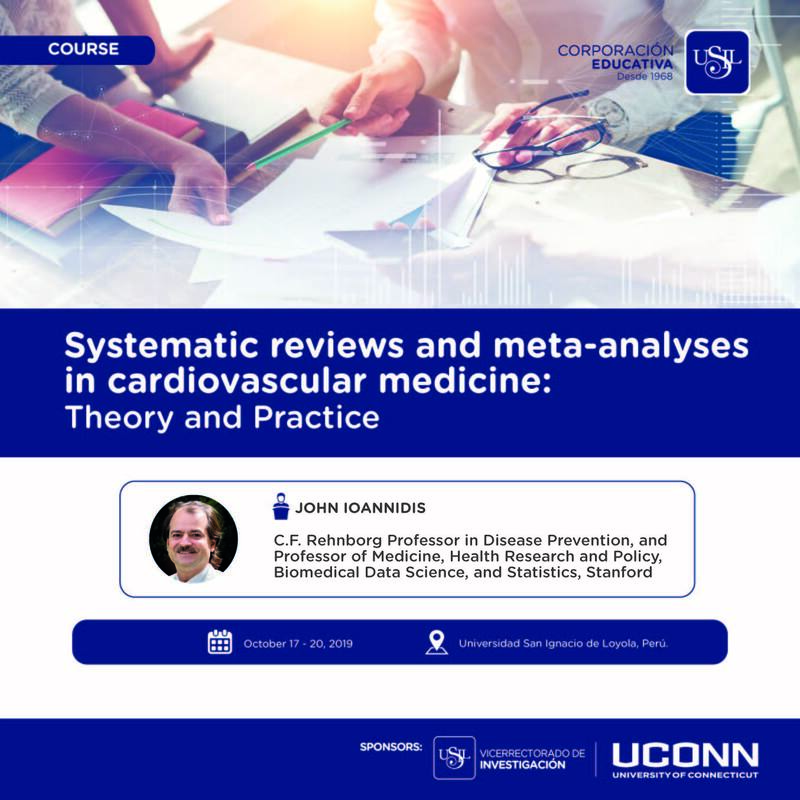 Associate Professor of Comparative Effectiveness and Outcomes Research, University of Connecticut, Storrs, CT, USA.